Jay Sirmans was born April 16, 1864 and lived all of his life in the vicinity of Ray City, GA.
On 22 March 1893 Jay Sirmans married Rachel Allifar Smith (born July 30, 1869) a daughter of Mary Jane Smith and John Woods Smith. J B Mitchell Sirmans, born January 19, 1905 in Berrien County, GA; died July 13, 1983 in Lanier County, Georgia; buried Empire Cemetery. In 1899, Jay Sirmans gained a bit of local attention after his attempt to capture a large alligator for exhibition in the western states. Jay Sirmans died rather unexpectedly at the age of 52. Mr. J. Sirmans, a well known resident of Berrien county, living about a mile and a half from Ray City, died at his home Wednesday night at 9 o’clock, says the Valdosta Times. Mr. Sirmans had been ill for about 10 days but his condition was not thought to be serious. His death came as a great surprise. Mr. Sirmans is survived by his wife and two sons. Sirmans was buried at Beaver Dam Cemetery, Ray City, GA. He was a member of Woodmen of the World, and insurance through the fraternal organization provided a large and distinctive monument to mark his grave. Annie B. Sirmans was the granddaughter of Anne Donald Clements and General Levi J. Knight, and the daughter of Elizabeth Knight and Hardeman Sirmans. About 1931, she inherited Ray’s Mill which had been founded by her grandfather and her uncle Thomas M. Ray almost 70 years earlier. Annie B. Sirmans was born on Christmas day, 25 December 1872 in Berrien County, GA. 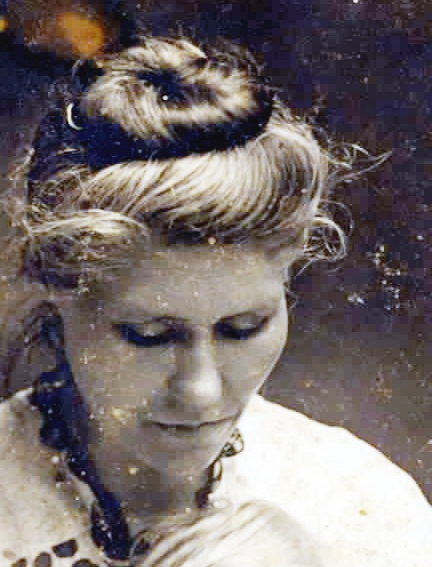 In 1880, seven-year-old Annie Sirmans was living with her parents and eight brothers and sisters in the 1144th Georgia Militia District, the Ray’s Mill district. Also boarding in the Sirmans home were two young girls, Eliza and Mary Hays. Annie’s father was a farmer, and her older brothers assisted with the farm labor. 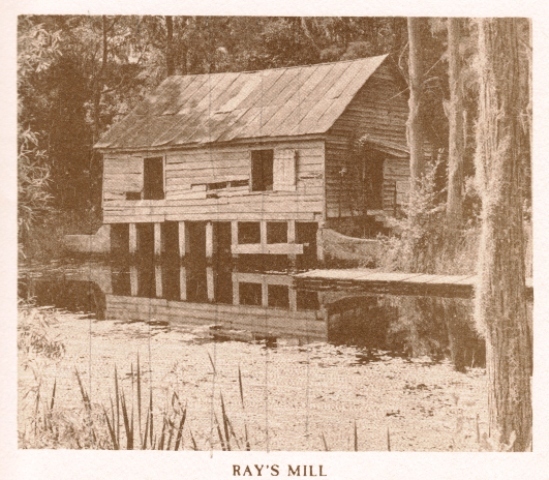 In 1890, her brother, Hardy Sirmans, Jr. purchased Ray’s Mill, the grist mill originally constructed on Beaver Dam Creek by his uncle Thomas M. Ray and grandfather, General Levi J. Knight. Assisted by Mitch Fountain, Hardy Sirmans, Jr. operated the mill until his death in 1931. As Annie grew older, she continued to live on her parent’s farm. On Sept 21, 1896 her father died leaving her brother, Thomas Hardeman “Hardy” Sirmans, to become the head of the household. The census of 1900 shows Annie Sirmans was still at home in her brother’s household. Her mother and siblings, Bellaria and Joseph, and nephew Daniel Walker Sirmans also shared the house. In 1905 while in Tennessee, Annie’s brother Joe Sirmans married Olive Pearl Matheny, the daughter of Judith L. Craft and James W. Matheny. Joe Sirmans brought his bride back to make their home in Willacoochee, GA about 20 miles north of Ray’s Mill. No doubt it was through this family connection that Annie Sirmans came to know John Chilton Matheny, brother of Olive P. Matheny. John C. Matheny was thirty-something , with blue eyes and dark hair, average in height and build. He was a farmer and since age 22 when his father died, head of the Matheny family, responsible for his mother and siblings. 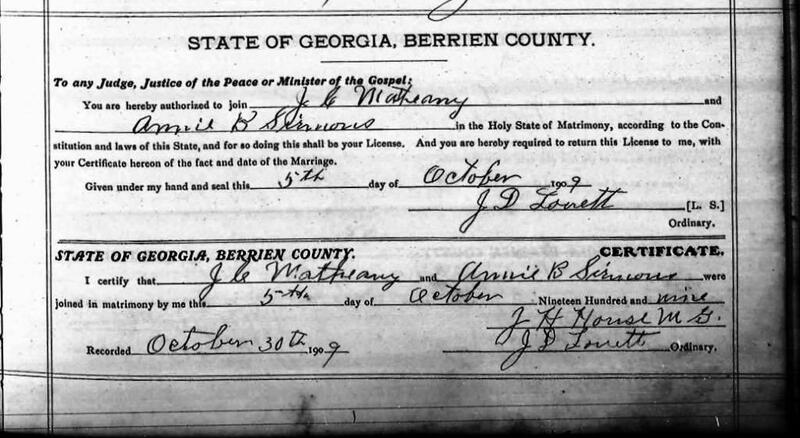 Four years later, On October 5, 1909 Annie B. Sirmans and John Chilton Matheny were wedded in Berrien County, GA. She was 37, he 35. It was the first marriage for both. At first, the newlyweds made their home near the Ray’s Mill community (now Ray City, GA) on the Sirmans home place, now the farm of Annie’s bachelor brother, Hardy Sirmans. Annie’s mother was still there at the Sirmans place, as well as her Aunt Mary Ray and nephew Daniel Walker. The census of 1910 shows Hardy Sirmans and John C. Matheny both farming on their own account. Annie may have married late, but within couple of years she was pregnant. On October 7, 1912 she gave birth to a baby boy. Sadly, the child died the same day. The infant was buried near his grand parents, Elizabeth and Hardeman Sirmans, at Empire Church cemetery, Berrien County, GA. The following year Annie was again pregnant, and on May 23, 1914 she presented John C. Matheny with a son, Thomas Hardeman Matheny. The image detail above is from a photograph of Annie and the boy (view the full image), probably taken around 1915, and clearly portrays her great affection for the child. 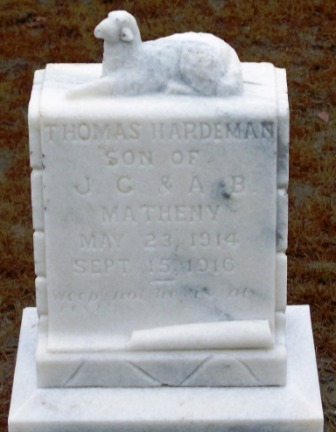 But tragedy struck the family again when Thomas died at age two on September 15, 1916. Perhaps the loss was too much for John Matheny to bear; A notation on the bottom of his 1917 draft registration written by Perry Thomas Knight observed that John had just returned from the insane asylum. Annie and John would remain childless for the rest of their lives. At that time the draft card notes, the Mathenys were making their home in Nashville, GA 10 miles above Ray City, but by the census of 1920 Annie and John Matheny were back at Ray City where they owned a farm on “Settlement Roads” that John worked on his own account. Annie’s older brother, Hardy Sirmans (Thomas Hardeman Sirmans), lived with the couple and also farmed. The farm next door was rented by Annie’s nephew, Daniel Walker Sirmans and his young family. In the census of 1930, the Mathenys were still living in the Ray’s Mill Precinct, the 1144th Georgia Militia District. They owned a home valued at $1000.00. John continued to work the farm on his own account: Annie assisted with the farm labor. Annie’s brother Hardy, now 70, still resided with the couple but no longer worked. The Mathenys had also taken in a boarder, Matthew F. Fender, who worked as a farm laborer. But the 1930s brought hard times in the life of Annie Sirmans Matheny. Annie’s brother, Hardy Sirmans, died on July 27, 1931. 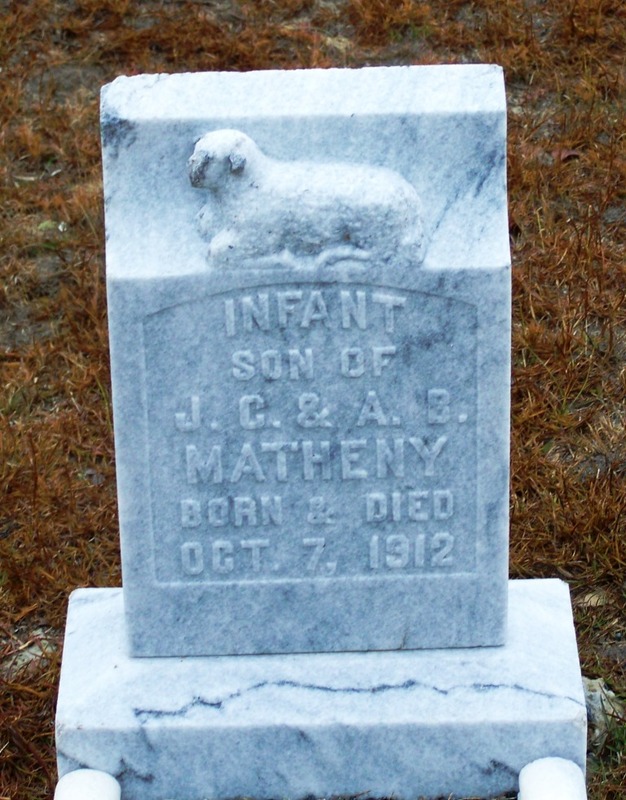 In 1932, Ann lost her husband: John Chilton Matheny died December 15, 1932. Both men were buried at Empire Cemetery, Berrien County, GA.
After the death of Hardy Sirmans, Annie inherited ownership of her family’s gristmill, Ray’s Mill. Later, the widowed Ann Matheny sold Ray’s Mill to Pollard Fountain, the son of Mitch Fountain who had operated the grist mill with her deceased brother. 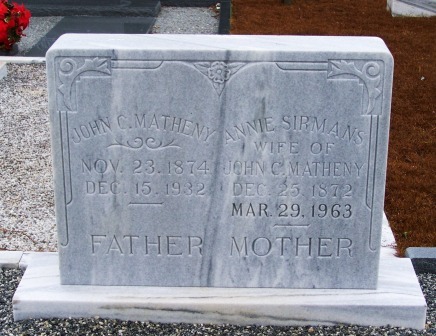 Annie Sirmans Matheny died in 1963 and was buried next to her husband at Empire Church Cemetery.